You know what's awesome? That moment you do something you didn't think you could. I've run forever but always had so much trouble breaking through the 5K mark. I remember so clearly the first time I finally ran 5 straight kilometers. It felt unreal. More recently, I hit 8K, all running. Today I hit 10K! Even though I've been athletic for a while and I've run for several years, I never fully felt like I GOT running. I did it to challenge myself, to burn calories, for the adrenalin but honestly, it was always hard. Something has happened though through my half marathon training...it's not so hard anymore. Don't get me wrong, my breath is still labored, my legs are still tired and my face is still an unnatural shade of red, but I'm really enjoying it. I enjoy the distance, I enjoy challenging myself to add speed or hills and I really like how it's changing my body, and complimenting my weight lifting muscles. Seeing now that I really CAN run is amazing. It makes me more likely to answer yes when someone asks me to run with them. It makes me feel like any athletic challenge presented is at least worth my best effort. 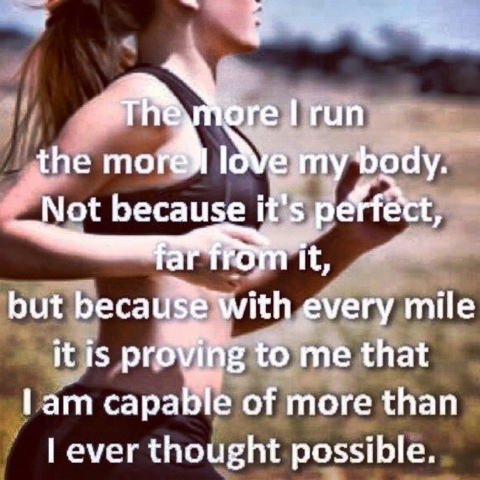 And it makes me feel like I've truly accomplished something because running has never, truly come easily to me (I'm short and short limbed...hardly a gazelle like runner!). Got out there and try something. See what you really can do when you set your mind to it. It's gonna feel so good when it hits you that you are way more capable than you thought! What's been your best "oh my goodness I did it!" moment? What's your next goal?